This continues my series on updated lessons from old stories. One of the most profound privileges of my career was to spend most of five weeks in late 2002 with 13 Afghan women teachers. After 9/11, much of my reporting at the Omaha World-Herald focused on the work of the Center for Afghanistan Studies at the University of Nebraska Omaha. It was the nation’s only academic center studying Afghanistan, so we suddenly found ourselves with some of the nation’s and the world’s leading experts on the distant country that suddenly mattered more to America than any other. I proposed several times that my editors send me to Afghanistan to cover various UNO projects abroad in Afghanistan and Pakistan. That would have been expensive and it would have been difficult, but we absolutely should have done it. My editors’ failure/refusal to make that happen remains one of the deepest disappointments of my career. I connected by satellite phone and email with UNO officials when they were in Afghanistan on projects we should have been covering. I used similar means to reach Afghan officials, U.S. officials and leaders of other aid organizations in Afghanistan who were working with UNO. I did my best but it was all second-hand reporting, grossly inadequate. My best shot at first-hand reporting came when UNO won a State Department grant to bring 13 Afghan women teachers to Nebraska for five weeks to teach them American culture and educational techniques. After years of Taliban bans on schooling for girls, these committed and courageous teachers were back on the job and UNO was going to help them be better teachers and teach their colleagues back home to be better teachers. Finally, I would get to witness UNO working directly with Afghans. I sought and was granted full access to the visit, invited to virtually embed myself at times in the Afghan teaching project almost as if I were covering a U.S. combat unit over in Afghanistan. I traveled with them around the Midwest. I visited in the homes of host families where they lived. I followed them to classes in UNO and around Omaha schools. Seldom have I been as touched and moved by the people I covered as I was by these Afghan women. Their courage, joy, perseverance and optimism amazed me day after day after day. I could see that these women had been changing the lives of Afghan girls and women for years (before and after the Taliban, Afghan schools were segregated by gender, so the women taught only girls and other women) and would do so again. In this series of blog posts, I re-examine memorable stories from my reporting career, both exploring the lessons I learned at the time and considering how I might tell the stories differently today, using digital tools and techniques. This post, like some of the others, will be quite long. I review five stories, plus sidebars. You’ve been warned. The biggest difference I can see is that video would play a huge role in telling these stories today. The sidebars I wrote might be entirely video stories, but other videos would enhance the main stories as well. I had a lot of confidence in my writing as a reporter, and like a lot of newspaper journalists, I had long been scornful of what I regarded as the shallow reporting by my television competitors. But that scorn perhaps kept me from fully understanding the value of video as a storytelling tool. The contrasts of the women’s clothing would have made for strong video – most covered in loose-fitting Afghan clothes that covered everything, even if not as confining as the burqas they had been freed from, but a few trying out American clothes, the youngest one wearing tight jeans under a shorter robe. The passion in the women’s faces and voices would have made strong video and audio. Translation would have presented some challenges that I would have experimented with. My interpreters were men who worked for UNO, so it would have sounded odd to have audio of a male voice speaking in English over a female face speaking on screen. Of course, I’d hope to collaborate with a visual journalist on the project, so I wouldn’t necessarily do the final editing on all the videos. But I’d experiment with using the women speaking in Dari on the audio and subtitles providing the translation from my notes and the audio translations from the UNO interpreters. Women doing a project like this today might be active in social media, so I’d also learn which, if any, social platforms they used and would curate their own tweets, photos, videos, Facebook posts (or posts on any Afghan or other foreign social platforms), getting translations of them, probably using a tool such as Storify or Spundge to curate their social content, either as sidebars or perhaps as a full main story or both. Another thing I’d do today is make an interactive map (using Google Maps, Intersect or maybe ThingLink) showing where the women came from in Afghanistan, with each woman’s icon on the map opening to a video of her telling a bit of her individual story. One of my disappointments in the written version of the story was that I don’t think I developed the individual characters as well as I would have liked to. Part of that was a function of newspaper space: We wouldn’t likely have printed 13 profiles of the women (I don’t think I even proposed it). Part of my difficulty in developing the separate characters was that the names were foreign enough to American readers that I think readers probably had trouble keeping them apart in my stories. But with a video profile of each embedded in the interactive map, I could certainly develop Parween and Saaraa and Masoomah and Suraiyaa and each of the 13 as the distinct characters I came to know them as. With their own faces and voices on video, they would stand out as individuals, not just a mass of strange-sounding names to American readers (I don’t mean this as an insult to American readers as much as an admission of a weakness in my writing through that challenge). Because of the combination of newspaper space limitations, the varying amounts of time I spent with different women, the fact that some women were more outgoing or more reserved and their varying language skills (as well as my efforts to develop a few of the most interesting ones a bit as characters), a few women just got mentioned once or twice in the series. If I were doing video interviews with each, I could do justice to everyone. NewHive might be a good tool for telling some of the stories in this series on digital platforms, combining text, still photos, videos, social curation and interactive features into one package. The fourth installment would have been the one that probably would work best on NewHive, but the first and third days might have worked well, too. Because the second was done on deadline, I don’t think I’d use NewHive there. When mosques in several Afghan communities announced the times for “tailoring” classes, the local Afghan women knew what the Taliban didn’t: Women attending the classes would not learn how to make burqas, but how to read. “We told the Taliban that we had lots of widows, and they would become a burden on the community unless they learned some skills,” Suraiyaa Aybaadi explained in an Omaha cafeteria, her reddish hair and ready smile no longer hidden behind a veil. Behind closed doors in Afghanistan, the women got out their books, notebooks and pens and began their defiant lessons. Suraiyaa is one of 13 Afghan women who are reveling in the challenges of learning English, trying American food and studying American schools after several years of teaching in secret under Taliban oppression. The Taliban did not allow women to teach or girls to attend schools. Women going out of their homes had to be accompanied by a male relative and had to shroud themselves in a head-to-foot burqa. In addition to hiding their beauty, the women visiting Omaha say they also hid books under the burqa. “Many, many women teachers in Afghanistan during those days … were trying hard to conduct classes, especially for the young girls,” said Rayhaanah, an elementary teacher from Kabul. Like many Afghans, she has only one name. These stories would have made particularly dramatic videos. I think I would have told the stories of teaching underground in defiance of the Taliban both in text and video. The visitors to Omaha told their stories mostly in Dari in interviews during their first week here, with translation by Raheem Yaseer of the University of Nebraska at Omaha. He is a native of Afghanistan. They are spending five weeks in the region under a State Department program run by UNO’s Center for Afghanistan Studies. They are here to learn about American education and culture. Their warmth and courage overwhelm their American hosts. “I left Omaha a completely new person,” said Tania Qadir, a high school junior from New York and a member of the Society for Aid to Reconstruct Afghanistan. The American-born daughter of Afghan refugees came to Omaha to help in a presentation for the teachers. Qadir would have made a good video in part because we wouldn’t have had to deal with translation issues. Suraiyaa, now an adult literacy teacher in Faizabad, offered “tailoring” classes in Kabul and a handful of provincial towns, teaching 300 to 350 women at each center. The Taliban discovered one of the schools and closed it. Suraiyaa, a mother of eight, is hardly ignorant. She speaks Arabic, Pashto, Uzbeki and Urdu, in addition to Dari and three other Farsi dialects. And she is quickly picking up English. The eyeglasses resting on her nose, secured by a chain looped behind her head, make her look like almost any middle-aged teacher. Before U.S. and Northern Alliance forces liberated Afghanistan from the Taliban, her impaired vision led to a beating. While the Omaha visitors embraced the opportunity to teach openly again after the Taliban defeat, freedom is returning slowly. Many women still wear the burqa in public, because they fear for their safety if they don’t. Teachers told of women who were threatened or who had acid thrown in their faces for appearing in public without the veil. In Omaha, the women show varying degrees of confidence about shedding the scarf or shawl that Afghan women are expected to wear on their heads in public in these freer times. Five or six at a time will slide the scarf down onto their shoulders or won’t bother to pull it up if it slips back on its own. One almost never wears a scarf. When shooting pictures of one another with their own cameras, some pull back their scarves, revealing flowing, curly hair. But when a television or newspaper camera appears, the women quickly pull up their scarves. The one who almost never wears a scarf keeps one handy in her purse, covering her head only for photographs that might be seen back home. Much as I would have wanted to tell parts of this story using video, this awareness of when they were on camera would have presented an issue. The women were telling a story (I can’t recall whether I could verify it, but I didn’t use it in the stories) about an Afghan woman who got punished in some way after being pictured with President George W. Bush on a visit to Washington with her head uncovered. Bill and I had to be sensitive to their concern, alerting them when he was shooting pictures, so the video wouldn’t have been able to show which ones felt comfortable uncovering their heads in my presence. In fact, despite my interest in showing the variety of their dress, I suspect the one who wore tight American jeans might have preferred not to be shot in video dressed that way. Some of the moments that I say here might have made great video probably wouldn’t have been caught on video. If this seems to an American like paranoia, one needs only to turn to the headlines to see why Afghan women still live in fear. During the teachers’ first week in Omaha, vandals fired rockets at two girls schools in Afghanistan, and burned blackboards and floor mats in two others. When the women visited a display of Afghan photography by Luke Powell in the UNO library, they quickly pointed out a photo of women shrouded in the burqa. “Without the veil we could not do anything,” said Najeebah, a junior high biology teacher from Jalalabad. Even under the veil, a woman had to abide by the Taliban’s strict code of modesty. Taliban soldiers carried wire cables to punish women. “If they noticed something fancy like white shoes or colored stockings or a fancy dress, they would beat my legs with the wires,” said Torpaykai Stanakzai. Nail polish or any sign of makeup also brought beatings. In Omaha, several of the women wear lipstick and light touches of other cosmetics. They wear polish on fingernails that are trimmed short. They wear mostly traditional Afghan clothes in Omaha, loose-fitting patloon trousers covered by a calf-length balapoosh (kind of a cross between a dress and a coat), or an ankle-length skirt or payran dress. Some work a T-shirt or sweat shirt given by their host families into the outfit. A couple have worn blue jeans under the balapoosh. Though the ban on education, especially for girls, started with the Taliban, Afghanistan has been in violence and turmoil for much of the lives of the teachers. This was a riveting interview that would have been powerful on video. Like the Taliban, Saleemah is a Pashtun, Afghanistan’s largest ethnic group. She lived in Mazar-e Sharif, a largely Hazara city. When the Taliban captured the city, her son brought two Hazara friends to hide in her house, feeling they were safe in a Pashtun home. The Taliban found out and killed the two youths in Saleemah’s house. 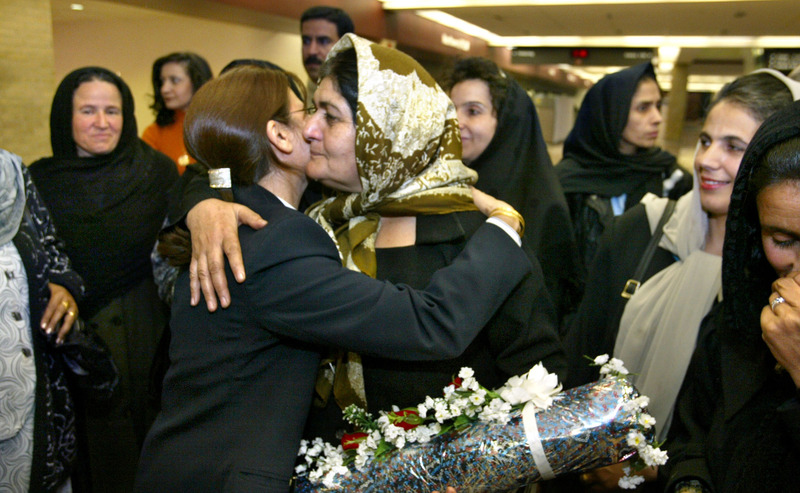 They took her husband and son away until a relative negotiated their release 10 days later. The Taliban closed Torpaykai’s two schools she was running secretly in her apartment. She taught first, second and third grades as well as actually teaching tailoring to teen-age girls. They made children’s clothes, bedspreads and sheets. One day, two Taliban soldiers shut down her school and arrested her husband. They kept him at their headquarters all day, telling him he would be severely punished if his wife reopened the school. “The little girls were very much upset,” Torpaykai said. Her school had attracted girls from throughout the neighborhood. After the warning, Torpaykai resumed teaching, but only for girls in her building. Rayhaanah knew the risk she faced in teaching in defiance of the Taliban. She knew of a male teacher who was beaten and arrested for teaching English. She didn’t know what became of him after he went to jail. Nonetheless, Rayhaanah held classes in her apartment, telling the girls to come one or two at a time, rather than arriving in a group and attracting attention. The Taliban still caught wind of the school. She was let off with a warning. This sidebar would have been done exclusively as a video and would be much better as a video. “Book,” one answers. “Window,” another says. Others reply “notebook,” “newspaper” and “dictionary.” They write their new English vocabulary words on the blackboard and demonstrate by opening and closing objects on the instructor’s table. “Umbrella,” says Parween Arghandaywal, pulling a colorful one from a hook on the classroom wall and opening it triumphantly, to laughter from her colleagues. Because the women are illustrating with objects, no one answers “mind.” But that is why they have come to Omaha: They want to open minds, young and old, back in their homeland. The women, who teach students from elementary school through adult literacy programs, are spending five weeks in the Midlands to learn about American education and culture. The University of Nebraska at Omaha won a competition with seven other universities or organizations for a State Department grant to host this program. The women will spend the coming week in Scottsbluff and a few days in Oakland, Neb., but will spend most of their time in Omaha. Their first class each day is in English, taught when they are in Omaha by Anne Ludwig, assistant director of UNO’s intensive language program. Most of the women are in the twilight of life by standards of Afghanistan, where average life expectancy for women is 46. Ten are in their 40s. One is 50. Two are in their 20s. They embrace the challenge of a new language with the enthusiasm and energy of kindergartners. Though the women occupy fewer than half the desks, their chatter and laughter fill the classroom. They learn to spell “knife,” “fork,” “spoon,” “cup,” “saucer,” “teapot,” “coat,” “scarf,” “zipper” and “button,” 20 or more words a day. Ludwig cuts them no slack. When she holds a pitcher aloft, she shakes her head vigorously when they call it a jug, teapot and water pot. She writes pitcher on the blackboard as the teachers sound it out. Teaching verbs as well as nouns, Ludwig directs the women to open and close objects, pick them up and put them down, push them and pull them, stand up, sit down, spell, point, write and erase. They learn “put on” and “take off” by repeatedly putting on a coat, scarf and slippers. Then they reverse roles, with Parween instructing Ludwig to put on her slippers, gloves, coat and hat, plus a scarf over the hat. At Parween’s order, Ludwig ties the scarf. Suraiyaa Aybaadi tells Parween to stand with the ridiculously attired instructor for a photo. All the women laugh as the camera flashes. Class ends most days with a chant, adding verses that use the teachers’ growing vocabulary. The women recognize it immediately as poetry. As with the first mainbar, I would tell this next story both in text and video. It was the only story that I wrote on deadline. My interviews about the Bamiyan Buddhas were conducted in a van as we drove from Scottsbluff to Mount Rushmore. I couldn’t have easily shot video of those interviews (and it wouldn’t have been very compelling video). I might have recorded audio in the van for a few clips to use as voiceover in a video shot mostly or entirely at Rushmore. The visit to Rushmore and their excitement at seeing it would have made compelling video, though. This story presented an interesting print-deadline writing challenge. The UNO Afghan immigrants who drove the vans up from Scottsbluff to Rushmore were Americanized in lots of ways, but not how they drive. They drove about 55 mph up rural highways through the Nebraska Panhandle and it took us longer than I had anticipated to get to Rushmore. In addition, we stopped at another park in the Black Hills to show the teachers some bison. At the bison stop, I got out of my UNO van and hopped into Bill’s company car, so I could start writing the story on my laptop as we drove the final leg to Rushmore. We got to Rushmore right on deadline for the World-Herald’s bulldog edition (which went out into the Nebraska Panhandle, so we wanted to get the story in that edition). I was able to catch a few minutes of the teachers’ reaction to Rushmore, then hustle into a National Park Service office to top off the story and send it while Bill was transmitting a photo. Transmitting photo and story would have been much easier now, as long as we had a cell or wireless signal. If we had a signal, it would have been great covering this today to post quick Tout videos of the visit to Mount Rushmore. MOUNT RUSHMORE, S.D. ― The Afghan visitors understand this national treasure. Their Nebraska hosts have explained many sights, objects and customs during the two weeks since 13 Afghan teachers arrived in Omaha. Root beer floats, combines and the Kearney archway required explanation. Not a mountainside tribute. When the 13 women visited the four granite faces of U.S. presidents Saturday, they felt an appreciation even American visitors to the monument could not feel. Like American tourists, the Afghans took photos of one another at the viewing plaza, with the presidents looking down from on high. Unlike the American tourists, the Afghans know that even a national treasure carved in stone can disappear. More than 15 centuries ago, followers of Buddha carved two statues into a cliff near Bamiyan, Afghanistan, about 70 miles west of Kabul. For centuries, that monument was cherished, both by Buddhists and by the Muslims who inhabit modern-day Afghanistan. In March of last year, the Taliban condemned the Buddhas as false idols and blasted them off the mountainside. “I’m very disappointed that the Taliban destroyed and ruined one of our historical landmarks of Afghanistan,” said Masoomah Beenish, who lived in Bamiyan until she was 5 years old and recently returned to live there to teach elementary school. She never saw the Buddhas herself but has a postcard of a Taliban tank starting the desecration. 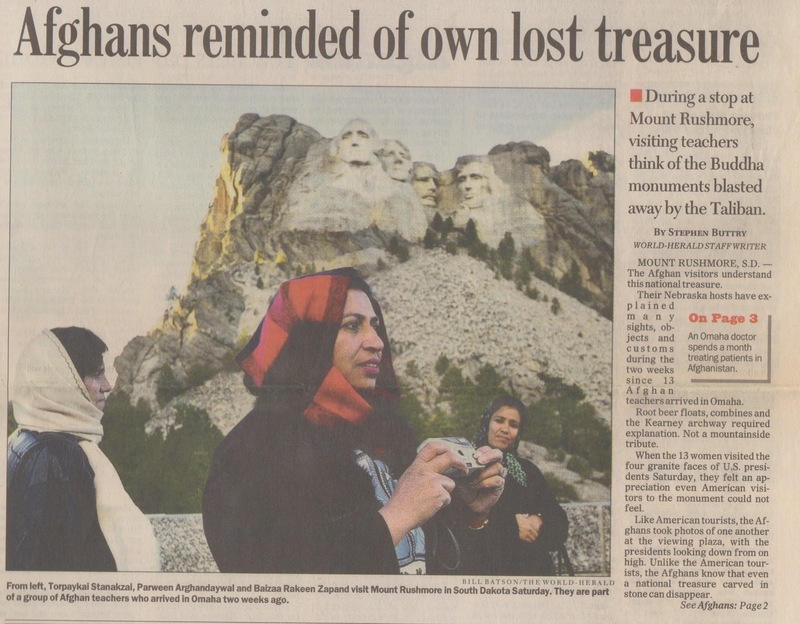 “It’s a national treasure,” Masoomah said of Mount Rushmore through an interpreter. As she looked up at the stone faces Saturday afternoon, she needed no translation. “Very nice,” she said in English, smiling. If I were doing this story today, I suspect the women would be posting photos of Rushmore and themselves at Rushmore to social media. Our photo/video coverage would be a mix of professional content Bill shot and curation of their social content. Masoomah and the other dozen teachers are spending five weeks in the Midlands under a cultural and educational exchange program hosted by the University of Nebraska at Omaha and funded by the U.S. State Department’s Bureau of Educational and Cultural Affairs. They spent last week in Scottsbluff, visiting schools and living with families in the area. Saturday they drove to the Black Hills and visited Mount Rushmore. They will visit Badlands National Park today on their way back to Omaha. In a country where poverty is widespread and transportation difficult, the Buddhas didn’t draw the type of large crowds that come to Mount Rushmore. None of the seven women in one van making the trip from Scottsbluff had actually visited the Buddhas. The driver, UNO’s Mohammed Basheer, had visited twice before immigrating to the United States. While the interviews themselves wouldn’t have made good video, a brief clip of the women talking in the van might have made a good clip for a video mostly dominated by Rushmore shots. I would have had to shoot this myself, because Bill wasn’t riding in the van with me. Someone had to drive the company car. Torpaykai Stanakzai, an elementary school teacher from Logar, said her husband visited the Buddhas. “Fifteen people stood together to cover one foot” of a statue. Though the women hadn’t seen the monuments in person, they had taught their students about them. “I point out to the students that Afghans have a very long history,” said Baizaa Rakeen Zapand, an elementary school teacher from Mazar-e Sharif. She cited the Buddhas as illustrations of the Afghans’ ancient culture. The teachers quickly rattled off details about the statues. Shamama, the larger one, was about 55 meters tall, nearly three times as tall as the faces on Mount Rushmore. Salala stood about 35 meters. Our video would surely include some stills and/or video from other sources of the Buddhas before and after the Taliban desecration. “When the Muslims from Saudi Arabia conquered Afghanistan centuries ago and the people accepted Islam, they did not destroy the statues of Buddha,” said Saaraa Omarzai, an elementary school teacher from Kandahar. Torpaykai said the Taliban destroyed the statues not for religious reasons but to steal the gold bars in the statues. “They took all the golden bars to Pakistan,” she said. I might make the Thanksgiving part of this next story entirely a video, or certainly primarily a video, with just a bit of Thanksgiving in the text story. The story ran Nov. 29, 2002, Black Friday. I probably would have focused more in the text version on the cultural interaction of the full trip, with just a Thanksgiving angle up high, plugging the video. Gratitude was even more abundant than food as the LaVelle family gathered around the dinner table Thursday with three beloved guests from the other side of the world. 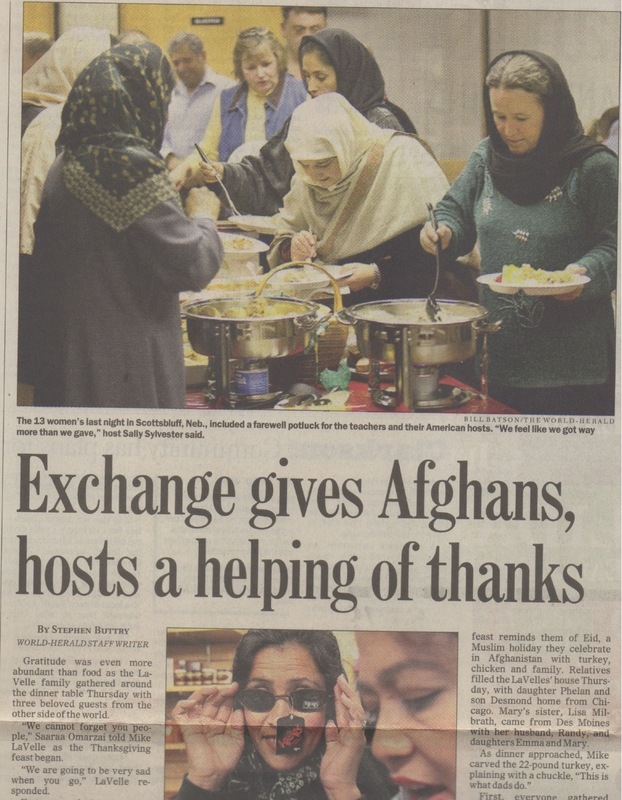 “We cannot forget you people,” Saaraa Omarzai told Mike LaVelle as the Thanksgiving feast began. “We are going to be very sad when you go,” LaVelle responded. For most of the past five weeks, Saaraa and two other Afghan teachers, Masoomah Beenish and Raahilah Mahmoodzaadah, have been living with the LaVelles. They and 10 other Afghan teachers are visiting Nebraska in an educational and cultural exchange hosted by the University of Nebraska at Omaha. They will leave Omaha on Monday, spending a few days in Washington before returning home. While the educational exchange involved carefully planned classes and tours of schools, accompanied by interpreters, much of the cultural exchange took place without translation in the homes of host families in Omaha, Scottsbluff and Oakland, Neb. The LaVelles grew close to Saaraa, Masoomah and Raahilah. 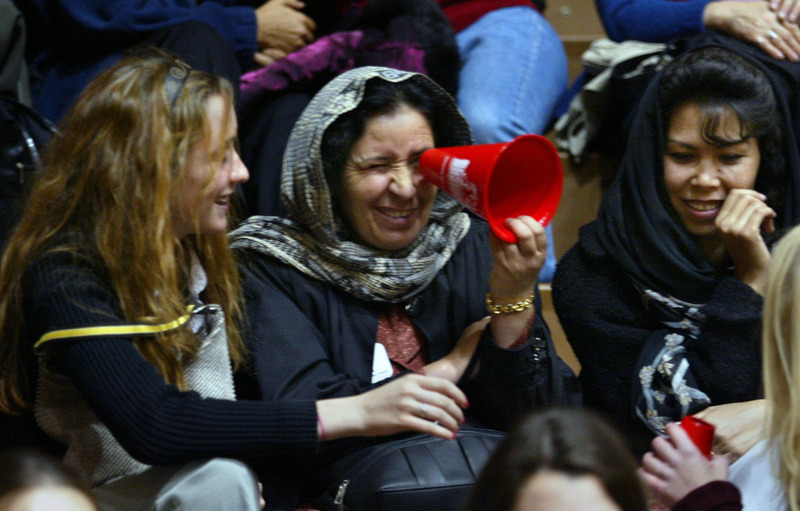 After five weeks of English classes and living in American homes, the women communicated ably in English on Thursday. They said the Thanksgiving feast reminds them of Eid, a Muslim holiday they celebrate in Afghanistan with turkey, chicken and family. Relatives filled the LaVelles’ house Thursday, with daughter Phelan and son Desmond home from Chicago. Mary’s sister, Lisa Milbrath, came from Des Moines with her husband, Randy, and daughters Emma and Mary. First, everyone gathered around the bird for a photograph. When Mike finished carving, Saaraa and Raahilah scooped out the dressing. For Eid, they stuff their turkeys and chickens with dried fruit. The Afghan guests made a green-bean casserole and candied sweet potatoes. Fruit salad, cranberry sauce, scalloped corn, beets, mashed potatoes and gravy rounded out the meal. American culture has moved, amazed, amused and bemused the 13 Afghans. Their immersion continues today when they visit Oak View Mall to see the crowds shopping. Host families showed the Afghans how they celebrated Halloween, how they worshipped and how they played. The video should certainly include a clip from Halloween and one from church. In Oakland, some of the women attended a wedding of friends of their hosts. At a bowling outing, Saaraa caught on quickly and beat Mary LaVelle. The video would need a bowling clip, too. I wasn’t there for that, but if we were doing video, we would have watched for opportunities such as a bowling night. UNO planned some cultural experiences for all 13 women: a night out for pizza, a UNO women’s volleyball game and a stop at South Dakota’s famed tourist trap, Wall Drug. “Very beautiful things,” Parween Arghandaywal said as she wandered past the jackalopes on display at Wall Drug. The women caught the drugstore’s spirit of fun, taking pictures of one another standing and sitting with statues of Old West figures. A video clip of the women looking at the tacky merchandise and attractions of Wall Drug would have been fun. We’ll have to settle for this photo of me with some of the women, taken by Bill. I won’t identify the women in the photo, since one of them didn’t cover her head and one was wearing jeans. I’m the guy with the notebook. Technology especially fascinated the Afghans. “Pretty much everything electronic is new to them,” said Jennifer Stahl, who with her sister Charity hosted Torpaykai Stanakzai and Rayhaanah. Each time they heard it shift to a new cycle, Baizaa lifted the lid to see what was happening. Unfortunately, I wasn’t there for the washing machine incident, but that would have made a great video clip. Saleemah was surprised to see a husband washing dishes and clothes, which she said an Afghan man would never do. Many of the visitors didn’t enjoy American food. They found traditional American apple pie far too sweet. “We like hot pepper and salt with food,” Masoomah said Thursday. About half an hour later, she was sprinkling salt and pepper generously on her mashed potatoes. Stahl’s guests loved her grandmother’s pickles and breakfast burritos. 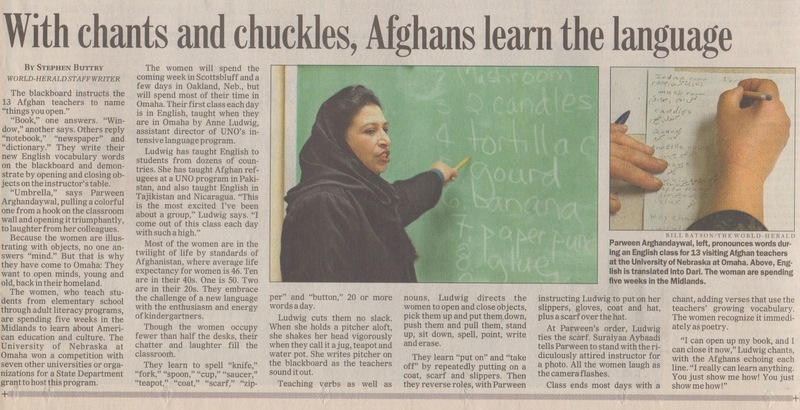 “They like ice cream,” Ron Sylvester said on the women’s last night in Scottsbluff, drawing laughter from the Afghans. Two of the teachers knew women in the photos Kathy Bosch showed them. Bosch called helping with their English lessons “one of the most thrilling experiences of my life.” She wept when Torpaykai gave her a lapis-lazuli necklace. Several of the Afghans said their view of Americans, shaped by the news and entertainment media back home, was that the people would be arrogant. Their Nebraska hosts changed that. “The people are so very hospitable and so kind. I was wrong,” Saleemah said. At the farewell potluck dinner in Scottsbluff, Suraiyaa led the women in singing a patriotic Afghan song. Though the Americans couldn’t understand the words, they found the melody enchanting as Suraiyaa sang four verses a cappella, with the rest of the Afghans joining for a chorus. This song was one of the most moving moments of the Afghans’ visit. It would have made a great video. Even though we couldn’t understand the words, the women’s voices and faces conveyed deep emotion. After sustained applause, translator Raheem Yaseer of UNO explained that the song first described the beauty of pre-war Afghanistan and then the destruction it has endured, listing places such as Bamiyan and Kabul that are in ruins. This would have worked well in the video, more moving than usual, if not quite as powerful as the Afghans’ song. familiar song had taken on new meaning. The World-Herald, like a lot of newspapers back then, was trying to cut down on jumps, so we occasionally used a brief page-one story like the one below, to plug a longer story that runs inside. I think the farewell would work better as a video. 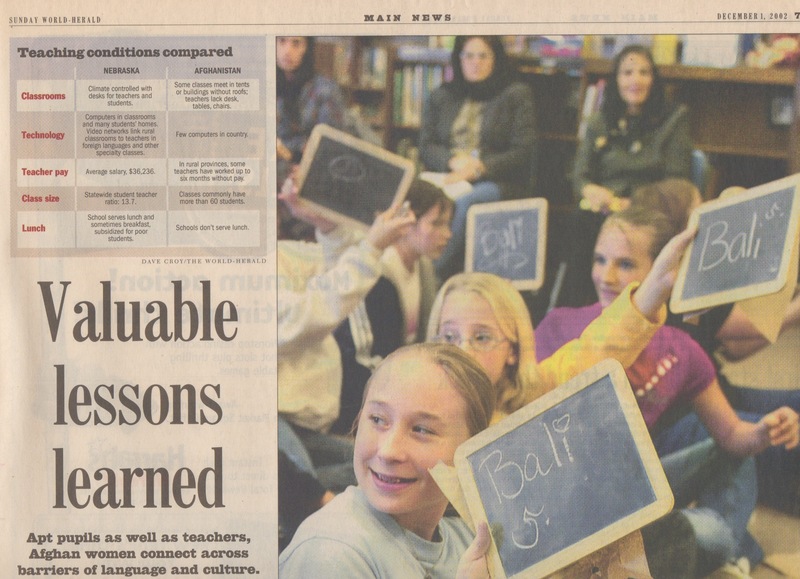 The story was published Dec. 1, 2002. Saying goodbye has been painful for Omaha’s Afghan visitors, but work beckons in classrooms back home. 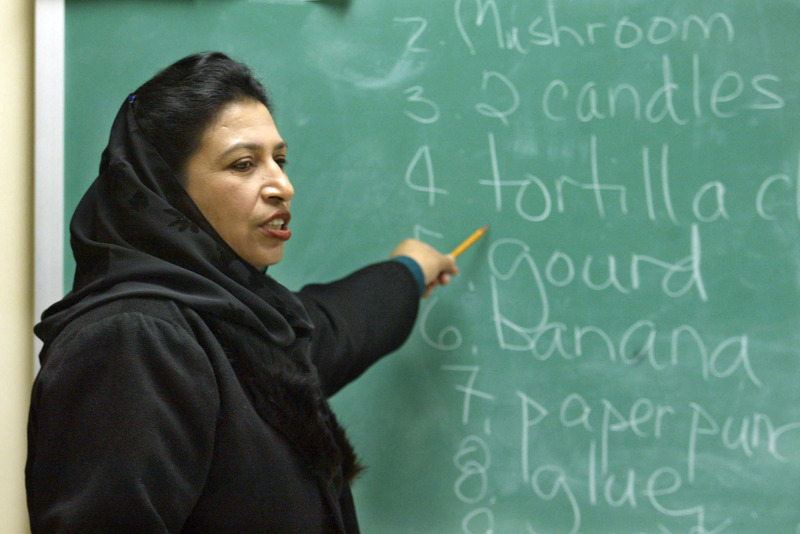 “Teacher, today is very difficult for us,” Saleemah told instructor Anne Ludwig on the last day of English classes for 13 teachers from Afghanistan who have spent the past five weeks visiting Nebraska. “No goodbye, no goodbye. I’m crying,” Torpaykai Stanakzai said as sniffles echoed around the classroom. However close the women feel to their new American friends, they will say their farewells and return to the challenge that brought them here: teaching in a homeland starved for education. From the first, they have expressed determination to transform Afghan schools with the lessons they have learned in Nebraska classrooms. “We are excited to take those experiences back and apply them,” Naseemah Yoosufzai said. After a farewell luncheon today at the University of Nebraska at Omaha, which hosted their educational and cultural exchange, the teachers will fly to Washington for four days. They will start their return flight to Kabul on Friday evening. “We gained experience and accumulated some knowledge of education from kindergarten level to high school,” said Baizaa Rakeen Zapand. Sitting in padded, adjustable ergonomic chairs around an Omaha conference table, 13 Afghan teachers tell about classes a world away. Speaking rapidly in Dari, several talking at once, they tell of students sitting on floors, of classrooms lacking desks, roofs and walls. University of Nebraska at Omaha education professor Carol Lloyd, struggling to grasp the depth of their deprivation, asks what they need most. This would be a dramatic moment to capture on video. Lloyd could spend the whole class period listening. But soon the women push to move on. These teachers have endured more than two decades of war. Many taught in underground schools in defiance of the Taliban’s prohibition on education for girls and women. They will not let language barriers, cultural differences or a teacher’s fascination with their stories keep them from their lesson. Soon Lloyd is explaining the “behaviorist model” of education, then the “interactive model.” This is what the teachers have come thousands of miles to learn: how to teach better. The women have spent five weeks in Nebraska, a whirlwind tour of classes, travel and school visits. The Afghans politely answer questions about their own culture, schools and experiences. But in the classroom, they repeatedly steer the topic back to their lessons. At times they have demonstrated their skill at keeping a class on task, pushing professors or host teachers to present more demanding or more useful material. Much of the technology and prosperity the Afghans have seen in Nebraska classes seems as elusive to their homeland as peace. Some of these teachers mix battery lead with water to make paint so they can write on walls of classrooms with no blackboards. “The facilities that are used in teaching here are overwhelming,” said Baizaa Rakeen Zapand, who teaches an elementary class of 63 students in a United Nations Children’s Fund tent in Mazar-e Sharif. The tent, intended for a single class, holds three. Most Afghan schools meet in two or three daily shifts because they have too many students. 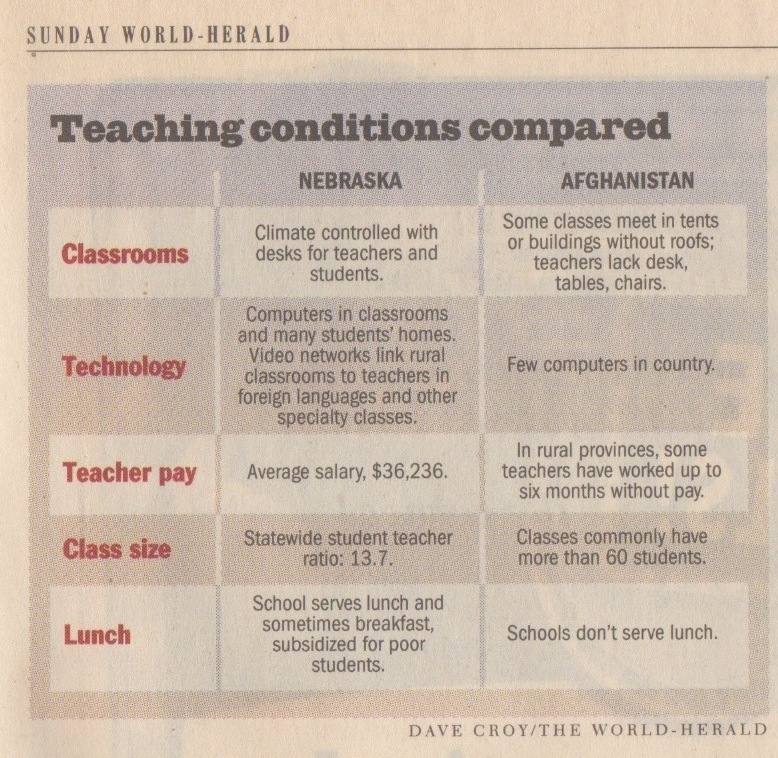 Nebraska educators marveled at the conditions under which the Afghans teach. “Our people would scream,” said Omaha South High School Principal Nancy Faber after learning that Afghan classes average 60 or more students. Faber, who has nearly 1,600 students in her school, conversed at length with Parween Arghandaywal, principal of a Kabul school with 4,500 students. Faber has four assistant principals, Parween none. Faber’s staff has 200 teachers, Parween’s 120. At schools in Omaha, Scottsbluff and Oakland, Neb., the Afghan teachers have commented again and again on the contrasts between Afghan and American schools – in buildings, facilities, technology and class sizes. Noting the Muslim practice of praying five times daily, the Afghans said American teachers and children should pray 10 times a day, in thanks for their blessings. Across the barriers of abundance, language and culture, the teachers say they have learned valuable lessons in this educational and cultural exchange, directed by UNO and funded by the U.S. State Department. The women hope to take their lessons home in three ways: by pressing Afghanistan’s Ministry of Education to provide better facilities and programs, by leading workshops for other teachers and by teaching better in their own classes. She plans to write songs in Dari to teach simple concepts. “They were teaching everything in songs – days of the week, months, numbers, parts of the body, the alphabet,” Naseemah said through a translator. While the visiting teachers could only dream of having labs like those they visited here, they paid close attention when teachers use ordinary objects such as fruit in their lessons. The teachers will bring home a starter supply of technology. The State Department grant paid for a laptop computer for each woman and training. A video clip of the women learning to use their laptops would have been good. The women especially were interested in visiting special-education programs. They saw students getting individual attention in regular classrooms. They visited a regional center in Scottsbluff that helps children with multiple handicaps. Afghan teachers deal with more physical and mental handicaps than their American colleagues because of the damage from malnutrition, war and land mines. Torpaykai Stanakzai wept while watching special-education students at Oakland-Craig secondary schools make cookie jars for a holiday fund-raiser. A student with Down syndrome reminded her of her own 11-year-old daughter. Like other severely disabled Afghan children, her daughter can’t go to school. “I am hopeful that she will have an opportunity to get special education and special attention,” Torpaykai, an elementary school teacher from Logar, said later. Naseemah said she would ask the Ministry of Education to establish special-education programs. “The need is greater now than ever,” she said. 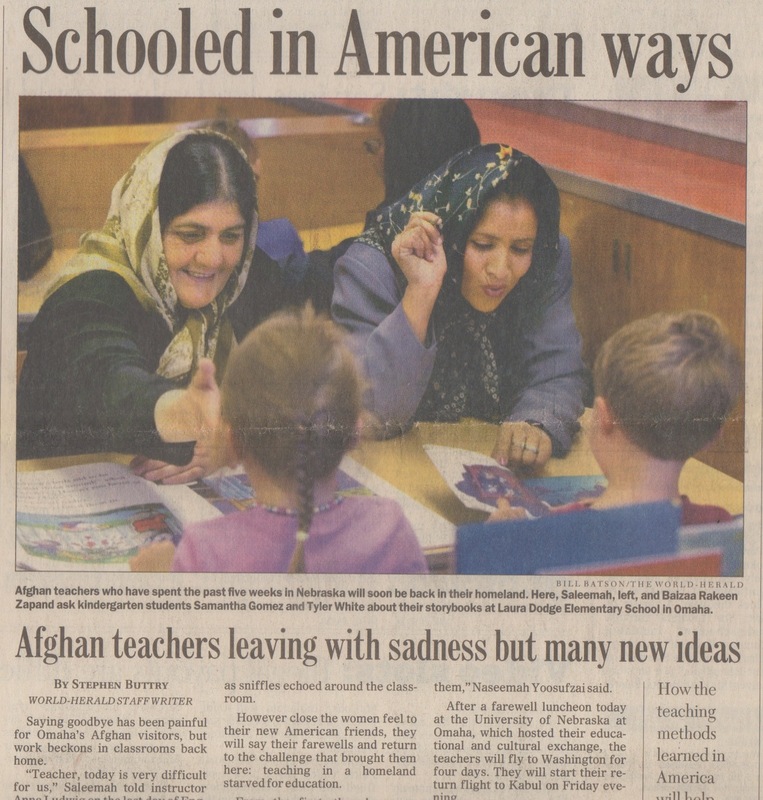 The Afghan women connected with children across the language and cultural barriers as they visited Nebraska schools. At St. Margaret Mary School, third-graders eagerly held out their notebooks after a teacher wrote one student’s name in his notebook in Dari. In the Afghans’ last visit to a Nebraska school, children at Laura Dodge Elementary School in Omaha sat on the library floor, figuring math problems in chalk on handheld slate boards, simulating a fortunate Afghan class. Their teacher, Howard Faber, learned Dari in the Peace Corps and has helped in UNO’s programs in Afghanistan. Sixth-grade students were to figure out whether two fractions were equal. Nafeesah wrote in the Persian alphabet the Dari words for yes and no. If the fractions were equal, the students would write “yes” in English and Dari. If they were unequal, they would write “no” in both languages. Faber told them to show their answers to the Afghan teachers. In different classes at different grade levels in Omaha, Scottsbluff and Oakland, the scene has been repeated during the time the women have spent learning and teaching here. The information in the graphic below would work well as an interactive graphic, perhaps using Prezi. This is an example of how journalists’ thinking needs to evolve. This kind of information used to be a sidebar story, but we started thinking of tables and other graphics as the best way to show such a comparison (even if it’s still mostly text). We need to think the same way about other digital story forms, such as interactive graphics, videos, curations and databases. This sidebar might work best just as a video. When Ana Lopez read her essay to visiting Afghan teachers, her words required translation. When Saleemah thanked the Omaha sixth-grader, her tears needed no translation. Ana wrote the essay last year, saying she wanted to give the women of Afghanistan the gift of hope. Inspired by stories about the Afghan women who have spent the last month visiting Nebraska, she came Wednesday to their last English class to present the gift of her essay. Spelling out hope, Ana used each letter to stand for another gift – H for health and happiness, O for opportunity, P for peace and E for education. Naseemah Yoosufzai presented Ana, a student at Morton Middle School, with a necklace bearing a charm of lapis lazuli, a bright blue semiprecious stone found in northeast Afghanistan. The stories of the Afghan women inspired a reader in Lincoln, Tammy Meneghini, a playwright who was scheduled to teach at an arts school in California. While I couldn’t talk my editors into a trip to Afghanistan, I did talk them into sending me to California for this story, which published Jan. 24, 2003. On a high school stage in the San Jacinto Mountains, the Afghan women who visited Nebraska last year continue to teach Americans. “The suffering they’ve had to go through and how they’ve endured with such hope is unfathomable,” said Lauren Rosi, who plays a character named for Saleemah, one of 13 teachers who spent November visiting schools, sights and homes in Nebraska. This weekend, Saleemah’s daughter, Fariha Atmar, plans to drive up from the San Diego area to watch the Idyllwild Arts Academy’s production of the Euripides play “The Trojan Women,” set in a bombed-out school in 1999 Afghanistan. 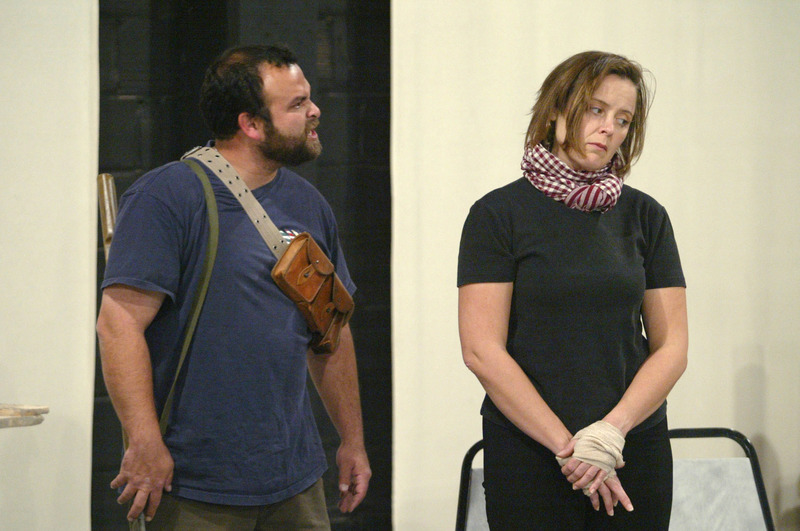 Tammy Meneghini, an actor and teacher who moved to Lincoln last fall and started teaching at Creighton University last week, made the connection between the Greek anti-war classic and the modern persecution of women in Afghanistan. She visited with the teachers before they returned to Afghanistan last month and took their stories and pictures back to her cast members in Idyllwild. A coincidence of timing brought Meneghini together with the teachers. She has spent most of her career in larger cities — acting, singing and teaching in New York, California, Chicago and Phoenix. After marrying Tim Stalker last summer, she moved to Lincoln, where he is a Web designer at the University of Nebraska-Lincoln. She continued working out of state, though, and agreed to direct a play for Idyllwild Arts Academy. The boarding school attracts students interested in the arts from 33 states and 20 countries to its wooded campus a mile high in the mountains between Los Angeles and Palm Springs. Meneghini wanted to present an anti-war play and selected “The Trojan Women,” which portrays the anguish of women who are treated as the spoils of war after the Greek conquest of Troy. Moved by news media accounts of the persecution of Afghan women by the Taliban, Meneghini wanted to set the show in Afghanistan during the Taliban regime. “I was kind of lamenting the fact that I was living in Lincoln, rather than New York,” Meneghini said. Her husband told her that the University of Nebraska at Omaha had a Center for Afghanistan Studies where she could do some research. When Meneghini called UNO in early November, she learned that the teachers were spending five weeks in Nebraska through a U.S. State Department grant. She accompanied them on a visit to St. Margaret Mary Catholic School in Omaha and marveled as they told students about teaching in secret when the Taliban had forbidden education for girls. A couple of weeks later, Meneghini met with the teachers, asking questions and telling them about the play. “The more I learned about you and your stories, I saw the relationship between your stories and the ancient Greek text,” she told them. Meneghini told scene designer Bonnie Carpenter the stories the teachers told Omaha children, about teaching in tents and in schools lacking roofs and walls. UNO provided Persian alphabet and number charts to adorn the battered walls of the school where the action takes place. 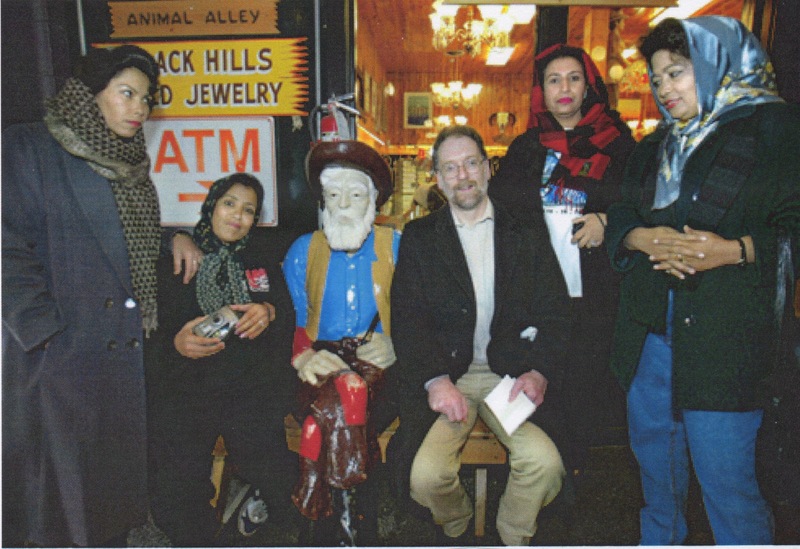 The printed program tells patrons about the Afghan women’s visit to Nebraska. A lobby display of Omaha World-Herald stories and Luke Powell photographs tells more about the Afghan women. Upon learning that Fariha, Saleemah’s daughter, lived in Southern California, Meneghini talked with her and invited her to the show. Meneghini also interviewed UNO officials and studied materials about the Afghan culture at UNO’s library. Mavis Leno, wife of comedian Jay Leno and a leading activist who worked to mobilize world opinion against the Taliban even before the 9/11 attacks, also has been invited. Meneghini belongs to a professional women’s theatrical group in Lincoln, Angels Theater Co., that also is considering presenting “The Trojan Women” set in Afghanistan. “I want to bring it back home and do something wonderful with it here,” Meneghini said in an interview in her Lincoln home. The Idyllwild cast includes students from Chicago, Minneapolis, Texas, New Mexico, Arizona, Washington state, Vancouver and all over California. The students are preparing for auditions with the nation’s top college theatrical programs, aspiring to careers in opera, theater, film, television and education. With a few exceptions, the students knew next to nothing about the women of Afghanistan before the 9/11 attacks. “I was oblivious to it,” said Ashley Peacock, a senior who plays Cassandra. All said they were amazed as they learned what the women had endured and how they persevered. The play, which opens today, is an engaging, if at times puzzling, mix of ancient and contemporary stories. Meneghini kept most of Euripides’ script and the names of primary characters. Some lines in the show, referring to Greek gods or to ships waiting for the captured slaves, clearly don’t fit in Muslim, landlocked Afghanistan. As the play goes on, the juxtaposition of the ancient and contemporary stories doesn’t seem so odd. Rather, it underscores the play’s timeless message. “It’s amazing how they do fit together,” said Teale Sperling, a sophomore who plays Najeebah. Several cast members find the show especially profound as the United States is on the brink of another war. “It baffles me that after all that time we’re still blowing each other up,” said Megan Greene, a senior who plays Hecuba. Meneghini tweaked the Euripides script in places, changing Poseidon’s crumbling “towers of stone” to “statues of stone,” an allusion to the mountainside statues of Buddha that the Taliban destroyed as false idols. She wove in Afghan songs, poetry and prayers, plus a passage from the book “My Forbidden Face” by Latifah, an Afghan teacher who escaped the Taliban. The women cover their heads with scarves. In two critical scenes, Hecuba and Andromache shroud themselves in head – to – toe burqas to be led away into slavery. “The first time you have to cover yourself and you feel it against your skin, it feels like you’re walking around in a cage, like you’re embarrassed of yourself,” said Amy Wilson, a junior who plays Helen. To help the actors understand the characters they would play, Meneghini had the girls cover themselves and walk across campus, about half a mile away. Unknown to the girls, Meneghini instructed the boys in the cast to play the part of Taliban soldiers and harass the girls. Jillian Chutick, a sophomore who plays Torpaykai, was wearing eye makeup, which a boy could see when her scarf slipped open. The “soldier” dragged her to a nearby hose and sprayed her to wash off the makeup. The experience was reminiscent of a story the Afghan visitors to Omaha told about being beaten if Taliban soldiers glimpsed makeup or fancy stockings beneath their burqas. By the time the girls reached their destination, “we were all just hysterically screaming,” Wilson said. The boys said they could not recognize the girls with all their skin covered. “They weren’t people. They were just these shrouds,” said Brandon Alter, a senior who plays a Taliban/Greek soldier. The 10 women in the chorus are named for 10 of the Afghan teachers. The actors learned about each of the teachers from World – Herald stories, from materials provided by UNO and from Meneghini’s stories. Hecuba, Andromache and Cassandra keep their Trojan names in the script, but the program gives each the name of an Afghan teacher as well. For several cast members, a scene between Hecuba and Andromache crystallized Euripides’ message and their message from the Afghan teachers.